Think of this: Every one of us reading this, woman and man alike, without exception was born of a woman. Do you know what your mother’s life was like at the time you were born? Who “midwifed” her, accompanying her in that time? Was your father with her? Did she feel God was with her? Embodying the Sacred is a beautiful guide to connecting deeply with God during pregnancy through scripture, reflections on “mothers, sisters, and saints” from the Bible, journaling exercises, personal rituals, and other artistic prompts. By tapping into the creative spirit in a Christian context, Conway has touched on a powerful way to connect an expectant mother with her God, her changing body, and her changing life. 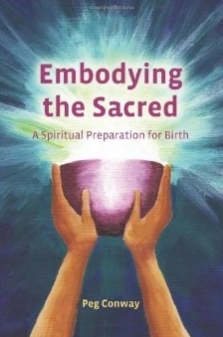 Anyone reading Embodying the Sacred is in good hands, because Conway, a childbirth educator and doula, has a solid knowledge of the birth process and the medical and non-medical systems from which women may be getting their care. Just as many women prepare a birth bag to have with them as they go into labor, the author wisely introduces the idea of packing a “spiritual birth bag” as well. This includes creating habits or spiritual disciplines that allow a mother to draw near to God as she goes into labor. Conway offers prayers to incorporate in daily life before the labor process begins and introduces symbols that may offer strength during labor. These preparations equip a woman for labor in a way that fits her into the biblical narrative by having those stories, psalms, and prayers to draw from. The pregnant woman is also directed by prompts to uncover her assumptions about God (who, after all, identifies with women in labor [see Isaiah 42:14] and motherhood [Isaiah 66:13]) as well as her assumptions about what it means to be a woman. She is encouraged to think about questions such as, what is involved in mothering? What is the nature of creation? What is the significance of being created male and female? Peg Conway uses the training she received from a method called “Birthing from Within,” a method derived from Pam England’s book by the same name. It is a method designed to use prompts for creative work to assist a prospective mother in harnessing conscious or unconscious strength for the work ahead. Each pregnancy comes at a different time in a woman’s life, with varying ages of other children or pregnancies that came before, so a mother’s spiritual, creative work is new each time. I’m glad to have such a guide as Conway has written to pass on to expectant Christian mothers. Pregnancy is a holy, complicated, sometimes tumultuous time. Conway recognizes that even as a woman’s body is creating new life, so is her spirit similarly engaged. Everything in her life is moving to make way for new life in all its fullness. At Birth Circle, I can show up to one place and get conversation about health matters, politics, relational, spiritual, and financial matters. Just like all our other creative endeavors, birth depends on all those parameters. It’s all very real, very “now.” Birth is a broad subject and discussion about it includes our past family experiences, the culture and economic systems we live in, our present dilemmas, our hopes, dreams, and fears for the future, all through women’s voices. I could go on and on. Talking about it gets my blood flowing! I’m sure that’s why Conway was moved to create this book. As this momentous occasion of physical birth arrives, it is to our peril that we neglect its spiritual nature. She says of her own experience, “For me, giving birth was transformative at a profound level,” noting that its power remains with her today. And though active in the church, she points out that “…the only real link between giving birth and…my Catholic faith was having our babies baptized”(p.5). I was surprised at how moved I, as a not-even-close-to-pregnant woman, was by this book. Conway’s book prompted me to ask, what if each of our mothers had had a theology of motherhood or birth given to her by a community of faith that valued her experience as one that connected to the larger story of how God works in our world— and how Jesus lives among us? As Conway eloquently says, “A more holistic appreciation of birth has grown in recent decades, but like a limb that atrophies from lack of use, our ability to truly articulate the spirituality of birth remains undeveloped” (p. 5). Instead, the theology that likely surrounded all our mothers was one of service, obedience, and sacrifice to support the male figures who were considered the actors in God’s work. Because this is the theme that other Christian books on pregnancy and birth support, Conway’s book is a fresh drink of water for the thirsty! By far the most common theology is one that tells a woman she is fulfilling her purpose as a child of God through motherhood. Popular Christian theology of birth puts the responsibility of becoming pregnant and having a healthy pregnancy, labor, and delivery on the mother—if only she understands what the Bible says and trusts and prays. The wisdom and good theology found in Embodying the Sacred, however, does not point mothers toward unquestioning obedience to church and medical structures. Instead, Conway trusts the pregnant mother to hear God through the tools she offers. She trusts the pregnant mother to feel and reflect on what is happening within her, using the Christian heritage to connect her with real strength, assurance, and insight from within. Indeed, Conway points out that church and medical structures have, in this momentous and vulnerable time (often in tandem with the government or culture), very easily exerted control over mothers and their children. These outside entities have over history determined who may work as medical providers (men), framed the conversation, and enforced their hierarchy. It has been centuries since birth was a “home-based women’s communal event” in the United States. This is a subject of urgency, as the maternal mortality rate in the US has nearly tripled since the 1980s and the laboring mothering herself is more easily dismissed or just plain overlooked in the presence of so much technology. Conway’s purpose here is not to take sides in any debate over how best to birth, but rather to present information, while acknowledging that, “These dynamics only add complexity (in) women’s lives as we approach this powerful rite of passage to motherhood” (p. 5). Embodying the Sacred fills a need I’d not been able to verbalize. My heart aches constantly over the failure to recognize women’s experiences in church materials, worship, and community life. Embodying the Sacred provides a format for a mother-to-be to connect deeply with God, Christian scripture, and her own spirit while she is going through a momentous event. This emphasis is what has been missing in other books about pregnancy and is a perfect complement to what many consider the bible of birth, Ina May’s Guide to Childbirth and Spiritual Midwifery by Ina May Gaskin , along with Pam England’s Birthing from Within. Conway ends Embodying the Sacred with suggestions on how to tell your story after the birth. Birth stories are so important and are the absolute highlight for everyone at the birth circle I attend. Women who come to birth circle often report that, as they labored and navigated the journey of childbirth, they were able to draw strength from thinking of the others of us in the circle, knowing that our group had known and supported them in their journey thus far and that they would return to share more of their stories. An immeasurable strength is provided when we know we are part of a larger story or group. To aid in such a connection between the pregnant mother and her spiritual family, her “cloud of witnesses,” Conway offers examples of different women in scripture in a section labeled, “Mothers, Sisters and Saints” that is included among the material provided for each trimester of pregnancy. She draws from historians and theologians to connect the reader more closely to the lives of these women in the Bible. Conway ends the book with one of my favorite chapters titled, “A Broader Landscape,” which gives the history of birth options, attitudes toward birth, how the church played a role in those aspects, and how “separate paths for medicine and midwifery…emerged along gender lines.” Before I read Conway’s book, I’d read many leading authorities on birth, especially Ina May Gaskin, in whose intentional community I chose to give birth to my second child. But while Gaskin’s wisdom is deep, true, and internationally recognized, and she connects our culture’s attitudes toward women (weaker, needing help, not exactly “normal”) to how dangers can arise in medical interventions when mothers are treated in medical settings dominated by men, she had left out some historical facts. Until Peg Conway’s book, I hadn’t heard anyone talk about the role that the Catholic church played historically in determining even who could be admitted to schools to study medicine (men), leading to the gender difference in who provided care. That’s one reason all Christian feminists can connect with birth. 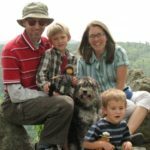 It is a glaring example of how church and gender issues influence women, but then also their children (which we all are!). The way women in childbirth, a natural event, are treated by the medical system is another example of how women’s bodily processes are misunderstood as some variation of male experiences. The women’s movement has largely occurred outside the church, without the biblical stories and the unique community of believers to shape it. It has valued women’s breaking into areas traditionally dominated by men. But we now need to redefine what is valuable for women. After all, the women’s movement (and all movements) are about power. Conway’s book, like England’s book, is designed to give women strength, power, and insight; and both authors’ books have shown that birth can be experienced as a rite of passage. But Conway’s book does this in a Christian context. I’ve always said about birth that it is one of those times where heaven and earth meet. Conway, too, identifies this idea and provides a name for those sacred times in the journey of labor as it gradually unfolds: “mysterium fascinosum” and “tremendum.” I dream that one day there will be a place in our Christian worship to include this power. Imagine! In the end, Embodying the Sacred allowed me to dream of a time when we go a step further yet and see gathered believers together embracing Conway’s wise insights into pregnancy and laboring, letting God speak through flesh and blood women and their partners who are experiencing it rather than talking about it abstractly and poetically every once in a while. I dream of a time when we hear the justice and power issues that are revealed, as well as recognizing the divine who comes into us and meets us as a baby.